Custom Tutorial Set Create and purchase your own Custom Tutorial Set that contains just the courses you want. 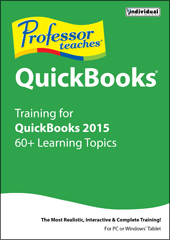 The Fastest, Easiest Way to Learn QuickBooks 2015! Professor Teaches courses use real-world settings and accurate simulations to help you apply your new knowledge directly to daily tasks and the knowledge you gain becomes an asset for life. • What are Debits and Credits?